In the most simplistic sense, player usage comes down to three main factors: health, eligibility (i.e. has he been suspended or not), & the biggest factor is manager’s decision. Obviously, the variables are endless when it comes to a manager deciding who should play or not (tactics, form, wages, personality, etc). A manager has no control over suspensions or injuries, but beyond that he wields an awful lot of power over a player’s career. How do we know if a manager is getting it right? Well, look at the table, dummy. Duh. Of course, that’s also how a winning team can become complacent & a lack of genuine competition within a squad can often lead to players not playing up to their capabilities. So, the use of data in this post is a little experiment. The goal is to see if statistics can help assess which lineup decisions are working & which ones aren’t. In this post, we’ll look at two managers: one who appears to be getting it right & one that’s not. Let’s start with Graeme Murty (spoiler alert: he’s getting it right). 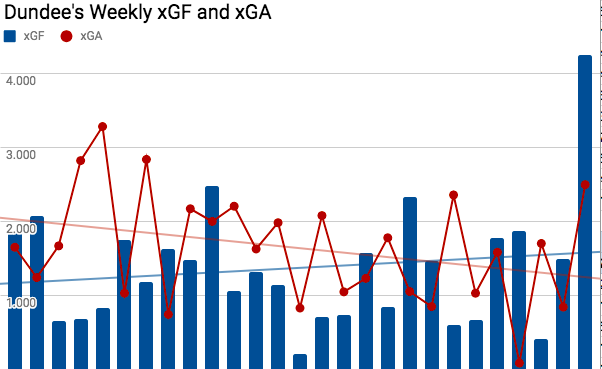 The graph below shows Rangers weekly Expected Goals for & against this season. For the most part this season, Rangers have put themselves in a position to win most of their matches. There have been some lulls in which the opposition is creating better chances (& more of them) but those matches have been isolated occurrences & corrected. Rangers have the second highest xG Ratio in the league this season at 61% (Celtic’s is 77%). That means they have created 61% of the Expected Goals in their matches, which basically means that they consistently are creating better chances than their opponent. They have generated an xG over 2.00 in ten of their games this season, their opponents have crossed that threshold only three times. Also notice their recent form, in their last five matches Rangers have generated 11.16 xG, while they have allowed teams to create 3.28 xG. That translates to an xG Ratio of 77% (the same as Celtic’s season long rate). The performances on the pitch are putting Rangers in a position to maximize their points & in fact they have earned 80% of the available points in those matches. 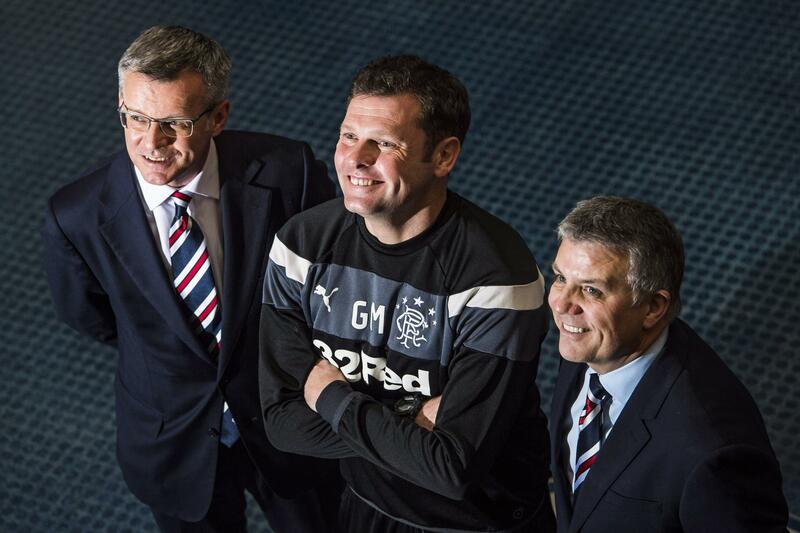 So…there are reasons to be optimistic as a Rangers supporter right now & Graeme Murty (& Mark Allen) deserve credit for helping fans look at the bright side in 2018. I mention Mark Allan because the latest influx of talent in the January window has had a real tangible impact in team’s performances & has given Murty some serious depth to play with. There is legitimate competition at some key positions & as players get healthy he will have some difficult decisions to make. Part of the decision making process comes down to what individual impact a player is having on the team’s chances of winning. 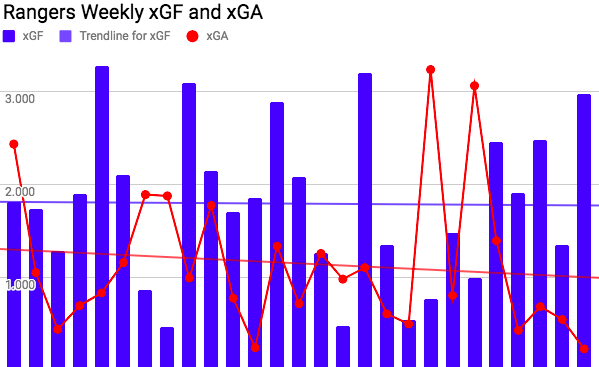 One way to measure that impact is a stat I call….xG Impact (I’m not very good at naming things…signed Rangers Report). xG Impact combines the Expected Goal of a shot with xG Chain to put a value on the chances a player either directly or indirectly created. Most of you are familiar with the concept of Expected Goals (if not, here’s a nice summary), while xG Chain is a stat introduced by Statsbomb back in January of 2017. Basically xG Chain goes beyond the player who made the Key Pass to create a shot as a means of giving other players in the passing network some credit as well. It’s not perfect, but in a recent post I highlighted how often the Secondary Shot Assist & the Establishing Pass (the third shot assist) often play key roles in the build-up play leading to a shot. Now, I get the fact that giving the player who got the actual shot & the player who happened to have the third shot assist isn’t necessarily the ideal approach…but it is a way to give credit to players who are having a direct or indirect impact on the chances that are created. xG Impact should be looked at as an entry point to further analysis & part of that is breaking down how that impact occurs (I’ll give that a try later in the post). Below you’ll see each player’s xG Impact per 90 minutes along with the percentage of the team’s available minutes that a player has played. The goal is to see if a player’s usage is aligned with their attacking impact in the opportunities they get to play. I wouldn’t look too much into players who have played less than 10% of the available minutes. For example, Ryan Hardie has an xG Impact on par with Alfredo Morelos. He also has only played 55 minutes for Rangers this season, so that would be the definition of small sample size. The same goes for Docherty, Cummings & Barojnas – they haven’t played enough minutes to truly measure their impact in Rangers lineup this season. Give it another month or so & we should be able to begin evaluating Cummings & Docherty’s impact. (For the season, Docherty’s xG Impact per 90 is 0.37 which isn’t all that great but part of that comes from the fact that Hamilton are really bad). Even using 20% of the team’s available minutes as a threshold should be used with caution. These players have gotten a few more minutes but it still isn’t really enough to make absolute conclusions. For example, I think we’d all agree that Niko Kranjcar’s output would decrease with more minutes. That blob in the middle of jumbled names is Eduardo Herrera & Carlos Pena. Herrera has the lowest xG Impact of any forward who has played more minutes which supports his exclusion from the lineup. At the same time, Jamie Murphy’s output in his limited minutes has been pretty sensational. Of the players who have played more, only Alfredo Morelos has had a bigger impact. Obviously, Murphy’s limited minutes was not a managerial decision, it was based on the fact he joined the club in January. His output so far has been a major contributor to the optimism that surrounds the club right now. Sean Goss is another recent addition who has impressed. His ability to drive play from a central role (coupled with Murphy out left & the combo of Candeias & Tavernier out right) has created a real balance to Rangers attack as they look for ways to get the ball to Morelos & Windass. Notice Goss’ xG Impact is higher than any other central midfielder this season. 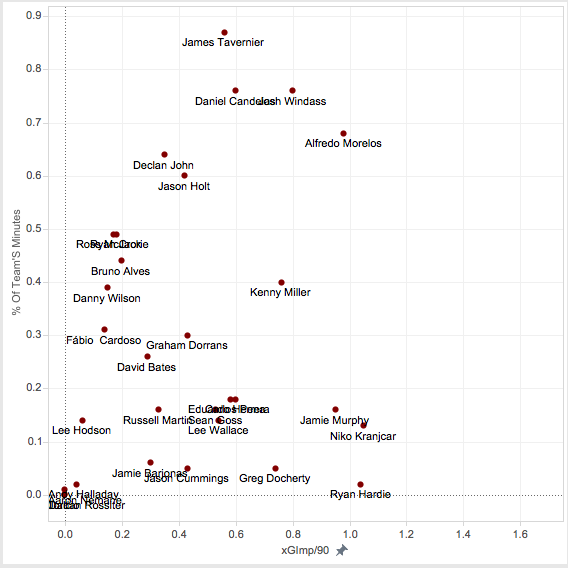 Dorrans & Holt have next highest rates but both are below 0.50, while Goss’ xG Impact per 90 is 0.53. Look at the players who have played the most minutes this season: Tavernier, Candeias, Windass & Morelos. They are all having a real impact on the team’s attack which supports the case to have them in the lineup. 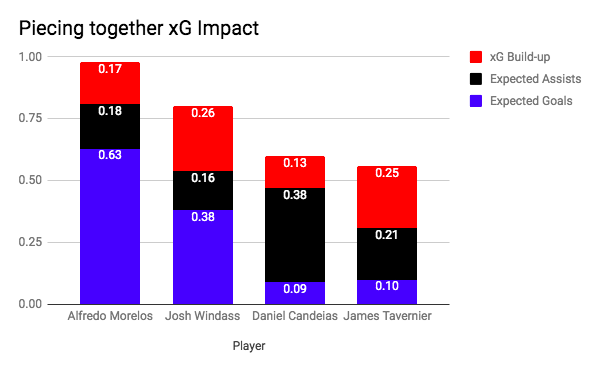 Morelos has an xG Impact per 90 of 0.98 & Windass’ rate is 0.80. Both players are so involved in Rangers chances that it basically equates to the likely contribution of nearly a goal a game. The jumbled blob just above Bruno Alves is Ryan Jack & Ross McCrorie. Remember, that xG Impact only measures a player’s impact on a team’s attack & neither of these players are relied upon to be playmakers. They have been used as defensive anchors in the midfield. In some matches, that role isn’t all that necessary – do Rangers really need a holding midfielder against a Hamilton or Partick? But given that neither player is currently available really hurts when they play against good attacking teams that can build attacks centrally like Celtic, Hibs, or Kilmarnock. For the most part, the players in the graph above seem to fall right into place considering the role they play. 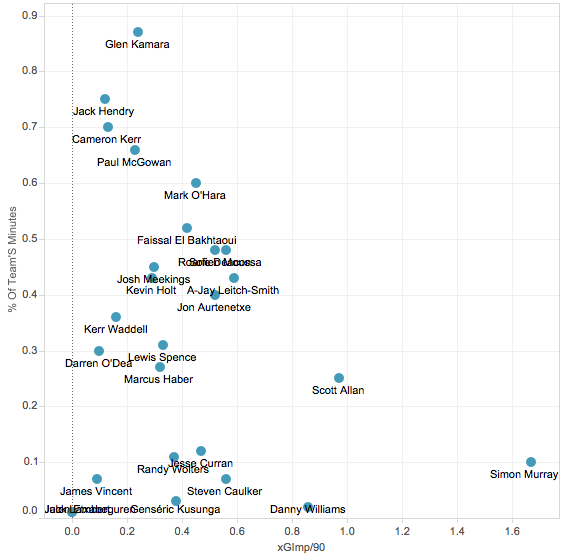 All of the players with an xG Impact of 0.30 or below are defenders or Ryan Jack. The only quibble I would have when it comes to player usage is that maybe a Ryan Jack isn’t needed against bad teams, but Murty hasn’t really been in a position to make that decision given Jack’s injury. So who knows if Ryan Jack would start those matches now? Jason Holt may be the only player who has played a majority of the available minutes whose output doesn’t look great. However, the only central midfielder who has played more than 10% of the minutes with a higher xG Impact per 90 is Goss…so if anything – the numbers support the decision to play Jason Holt up until the point that Sean Goss joined the team & subsequently replaced Holt in the lineup. That’s what it looks like when a manager is getting it right…. I was a big fan of Neil McCann the player & really miss him as a commentator. McCann’s handling of Scott Allan this season should be a sackable offense. Allan has been the best playmaking midfielder in the league (not named Stuart Armstrong) & he only played 25% of the available minutes this season for Dundee? Yes, he was injured for about a month but upon his return he was used almost exclusively as a sub & then was allowed to leave for a club that would actually play him. Remember how Alfredo Morelos’ xG Impact per 90 is 0.98…..Allan’s is 0.97. The next most impactful player who has played more than 20% of the minutes is AJ Leitch-Smith. 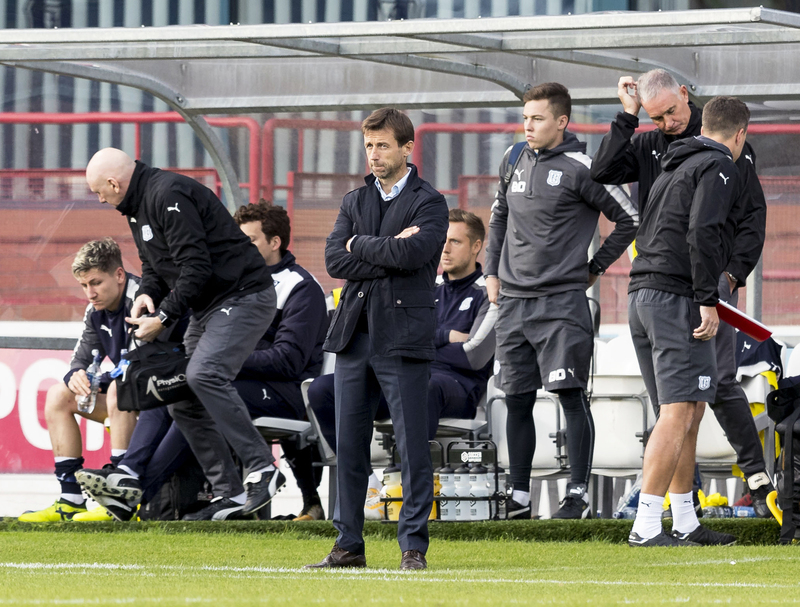 Let’s talk about Leitch-Smith, who has not been injured this season (that I know of) & McCann has left him on the bench for the majority of the minutes Dundee has played this season. How about full back Jon Aurtenetxe? He’s played 40% of the minutes but has the same xG Impact per 90 as midfielder Roarie Deacon (0.52). Maybe Aurtenetxe has defensive liabilities (I don’t know…I’m speculating) but when you’re a team that struggles to generate much offense, you find ways to cover for defensive ineffectiveness given the upside that comes with the trade-off. 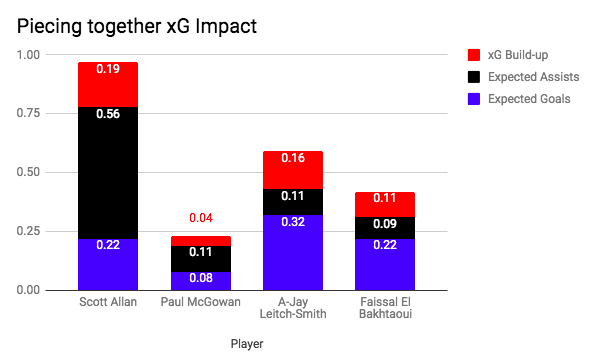 Aurtenetxe’s xG Impact is on par or better than the two players who have seen most time as forwards for Dundee (Moussa [he’s in the blob just above Leitch-Smith] & El Bakhtaoui). Dundee averages 1.37 xG for per game…which isn’t very good & they have an xG Ratio of 46% (not good, but not terrible – Partick’s 37% & St Johnstone’s 38% are terrible). Defence is a clear issue for the team as they allow 1.64 xG per match (only teams like Hamilton, Partick & St Johnstone are worse). Dundeehas allowed more than 2.0 xG in ten matches, while only generating more than 2.0 xG in four games this season. In fact, they failed to get above 1.0 xG in ten matches this season. Can a team that struggles so much to create chances…afford to not play the players who actually directly, or indirectly, make plays that lead to quality chances?? Let’s go back to the usage graph. Glen Kamara has played the most minutes this season for Dundee & even though his xG Impact is pretty poor, I lump him into that Ryan Jack/Ross McCrorie category. Kamara’s role is to play just ahead of the backline & look to transition the ball up the pitch. He’s connecting the play behind the likes of a Scott Allan or an overlapping Jon Aurtenetxe. Dundee’s shots don’t usually come from a passing network of 2-3 passes (they have 84 Establishing Passes this season…Scott Brown has 20). Kamara’s role is to get the ball into the attacking half where the team then can hope to win the possession game. I’ll stop for now…because we don’t need to start unpacking why Faissal El Bakhtaoui keeps getting minutes. But before we wrap all of this up….I wanted to share the next part of this process. Remember something like xG Impact should only be a starting point of further analysis. The next question to ask is, in what ways is a player contributing to that xG Impact? For example, here are Rangers big four: Morelos, Windass, Candeias, & Tavernier. It’s no surprise that Alfredo Morelos’ impact comes from the shots he generates (xG) & Daniel Candeias’ impact is his high rate of Expected Assists per 90. What may be surprising is Josh Windass’ impact on the build-up play leading to shots which is highlighted by the fact he has the highest xG Build-up of these four players (xG of the shot created from Secondary Shot Assists or Establishing Passes). Couple that with is high xG per 90 & you can see why Windass has been so important to the team’s attack this season. But, you can see there is a real balance in how chances are created from the four players who see the most playing time. For shits & giggles, here is the breakdown for Scott Allan & AJ Leitch-Smith along with the players who McCann gave their minutes to.